Rent our Speed boat to discover and enjoy the near by islands! Yamaha 2 stroke, power trim, electric starter, steering wheel, Gps-plotter, depth counter, radio mp3 with 4 speakers, cruising bimini, swimming ladder, cushioned seats canopy, safety eqp, mobile telephone, second backup outboard engine. Speedboat certificate required for the skipper. Hyperion is an Aiolos 5,86, very comfortable boat for up to 7 guests. If you are looking for a safe and quality boat for your family and friends this is what you need. It has a Yamaha 130 hp 2 strokes which gives a cruising speed of 23 knots to max 40 knots! Yamaha 130 is a very fast and reliable heavy duty engine, which requires a speedboat driving certificate. With this engine you may cruise safe and fast in many different harbors and beaches on same day. On boat there is also a wide bimini to protect you from sun and you may always keep it open while you cruising. All around the boat there are cushioned seats to make your travel even more comfortable. There is also a radio mp3 with 4 speakers all around the boat so you may always enjoy your favorite music all around your trip! Our boat is also equipped with a Gps-plotter that allows you all the time to know the exact place of the boat, speed and depth. You will never need to worry about where are you and where you heading to. Last boat has a second back up outboard engine Yamaha 3hp. And of course for any case there is a mobile on boat that you may use it any time to contact us. Skippers experience and capability of handling the boat, is the first and basic condition of each renting. This is for yours and boats safety. We don’t recommend or accept renting for any guests first time on boat or without any past driving experience. Our smaller motor boats with 30/40hp don’t require any speed boat driving certificate but the experience is a must. Our bigger boat with 130 hp is rented only with any speed boat certificate of your country and you need to have certificate with you all the time you will be on boat. The renter is the driver of the boat and doesn’t allow anyone else of his crew to handle it. Driver needs to be older than 18 years and alcohol is not allowed while handling the boat. If needed, on request we can arrange a skipper to handle the boat. Skippers’ fee varies according to the period from 80 to 100 euro per day. All boats are given with full tank of fuel and at the end of your trip we refill it so to know exactly the boats consumption. Fuel or engines oil is not included in boats rental price. 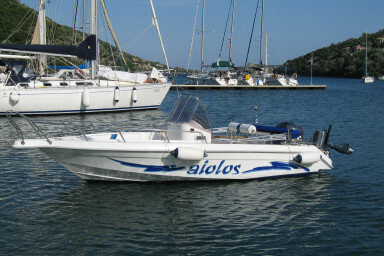 All boats are provided with all safety equipments (life jackets, fire extinguishers, etc ) that Greek regulations require. Each of our motorboats is in excellent service and detail maintenance so you will enjoy your trips. There is a second auxiliary outboard engine for backup, and in any rare chance of trouble occurs, we are available and in contact the whole time of your cruise. There is a mobile on each boat too, so to contact us for any trouble or question and if needed we will reach to your help. Crew on each boat must never exceed boats maximum legal capacity. 5 persons in total are allowed on our smaller 5 meter motorboats, and 7 on our bigger 6meters speedboat. Infants and children are counted in the numbers. If these numbers are exceeded locally, the boat hire company has the right to cancel the rental agreement. Renter needs to return boat at the same state as he took it over. Storm damage, or loss/damage due to inadequate or careless mooring, bad handling or negligence, is entirely the responsibility of the renter and will be charged accordingly. Renter is asked before taking over the boat, to check and inspect for any previous damages on boat and equipments. Propeller damage varies between 100 to 200 euros. All our boats are insured towards third party liability. Still any loss or damage of the crew is not included so we suggest checking with your travel insurance for this coverage. Bookings of our motorboats are done, either through our site contact, or on our boats base at Ionion Taverna Sivota Lefkada. For the confirmation of each booking a 30% deposit is required and rest cash, up on your arrival. It is recommended for the high season of July and August to pre book - reserve the dates you wish, as due to high season if you let it for last minute, you may not find any availability for the dates you like. Our speedboats are available at Sivota of Lefkada, from middle of April to the end of October for daily or weekly boat hire. Take over time is 09:00 to 11:00 am and for safety must be returned back to base before gets dark, 18:00. Earlier return doesn’t deduct any amount of the daily rental fee. Maximum cruising distance from the coast must not exceed 6 NM and each day boats needs to be back at its base in front of “Ionion” Taverna at Sivota Lefkada. An identification document of the renter will be asked to present before each sail out. In case of bad weather and sailing prohibition by the port authorities, the booking will move to the next possible day.